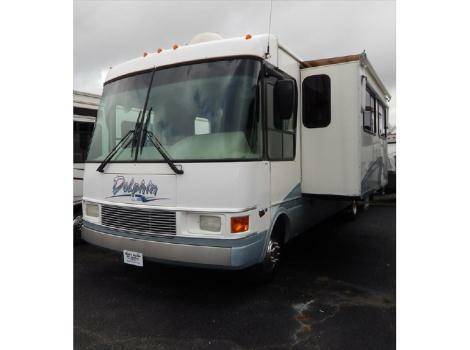 2000 National RV Dolphin 5360 w/ Rear Queen Single Slide Out, 2000 National RV Dolphin 5360 w/ Sofa - Dinette Slide Out #MH9955 Ford Series Triton V-10, dash fans,79,004 miles, TV, back up camera, rocker/recliner chair, pull out table, sofa w/ hide a bed, booth dinette, double kitchen sink, counter extension, 3 burner stove top, convection/microwave, double door refrigerator, side bath, toilet w/ foot flush, vanity w/ sink, hair dryer, tub/shower, glass shower door, skylight in shower, rear queen bedroom, 2 night stands, overhead cabinet, wardrobe w/ sliding glass door, TV shelf, mini blinds, 2nd roof A/C, TV antenna, furnace, screen door, awning, slide topper, dirt skirt, roof ladder, hitch, satellite dish (receiver not included) Generac Primepact 55G generator. Sleeps up to 6. Sale Price $29,995!